Lake Pichola is truly the most beautiful lake of Udaipur, The Venice of the East. To quote Rudyard Kipling in his Letters of Marque, 1899: 'If the Venetian owned the Pichola [lake] he might say with justice, `See it and die." The lake Pichola is manmade. It was made in 1362 by Pichhu Banjara and was completed by Rana Udai Singh. It is fed by a stream from the western mountains and is 2 ¼ miles long and 1¼ mile wide. 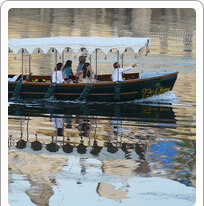 Pichola is the pride of Udaipur and certainly the heart of all tourist attractions here. It is encircled on all sides by awesome palaces, serene temples, family mansions, hills and rows of bathing ghats. At several places the lake at places narrows down and both its banks almost touch each other. At these locations, arched ornamental bridges add to the beauty of the lake. There are several islands on the lake, each with a famous palace or pavilion. The stunning Lake Palace as well as the glorious Jag Mandir and the Jag Niwas are all on this lake. A boat ride in the calm blue waters of this lake is an enchanting experience.